From acclaimed architect Roger Ferris, the only new development of its type on the Lower East Side, 141 East Houston is a new frame for viewing the neighborhood. Column-free and unbounded by walls, it reinterprets the area through a bold geometric perimeter of cladding and glass. State-of- the-art workspaces and private terraces reframe expectations, while a well-connected location recasts perspectives. 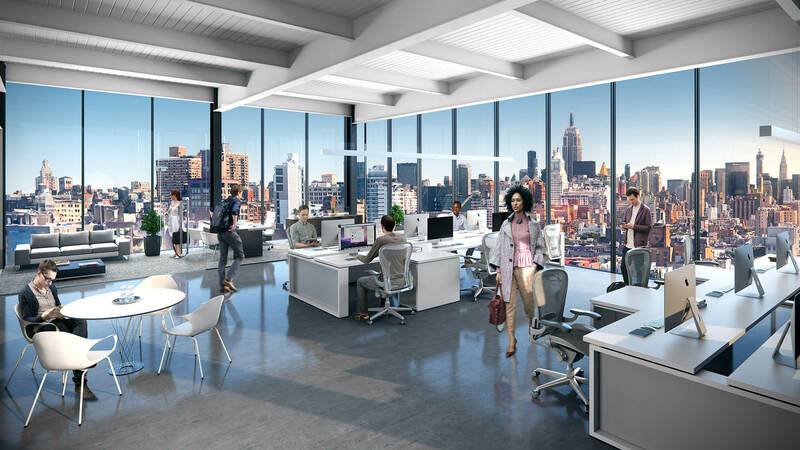 Tall, column-free spaces combine with true floor-to-ceiling glass for light-filled working complemented by unparalleled views. Private terraces, a shared executive conference center and a concierge service extend the experience. Eye-catching architecture, historic sites and specialty shopping characterize the storied Lower East Side. Adventurous and vibrant, it’s an enviable portal to upscale boutiques, trendy restaurants, chic bars and edgy galleries. 13. Clinton Street Baking Co.
Roger Ferris is the founding principal of Roger Ferris + Partners and is responsible for directing the design and master planning work of the firm. Under his leadership, RF+P has received more than 80 regional and national awards. His ability to work across a multitude of building types and scales is hinged by the tenacity and precision with which he approaches each project. Challenging the conventional architectural process in-order-to generate unconventional outcomes, Roger is fully involved in every aspect of the firm’s work at all stages through to delivery. His design ethos is characterized by stripped-down architectural language, responsiveness to context and inventiveness in meeting programmatic needs. Notable works include: The Related Equinox Hotel in Chicago, IL; The Bridge Clubhouse in Bridgehampton, NY; Screenland Lofts in Los Angeles, CA; Topping Rose House in Bridgehampton, NY; RBS Headquarters in Stamford, CT; Watermill Center in Water Mill, NY; and the expansion of Philip Johnson’s Wiley House in New Canaan, CT.
East End is a real estate investment company focusing on the development and repositioning of office, apartment and retail properties in New York and Miami. It identifies demographic trends, improving infrastructure and compelling fundamentals to invest today’s capital in tomorrow’s most compelling places.